Well of Wonders is the newest game to be released by Thunderkick. The game has already gone live at many Thunderkick powered casinos. Thanks to its unique game play and experience, it has proved to be quite a success among the players. The game has a 7 lined, 7 reeled format that is entertaining and rewarding. The game has wonderful visuals that succeed in delivering an immersive and an engaging ride. The soundtrack that is playing in the background is relaxing and helps immerse players deeper into the theme of the game. The game is playable through multiple platforms including PCs, Tablets, Laptops and mobile smart phones. This means that all players, regardless of what device they use to play, will be able to enjoy the game. Well of Wonders is an amazing slot game that has a lot to give to its players. The game has an exciting theme that takes players to the Well of Wonders. This well is full of prizes, wonders and magical runes. Players will be able to take advantage of those runes, and prizes by placing their bets and spinning the reels of the game. They will be able to do that by choosing one of the fixed bet amounts that the game has. The available bets vary between 0.1 and 100 credits for each spin. The symbols do not really spin on the reels, as they come out of the well of wonders in the background to appear scattered across the screen of the game. 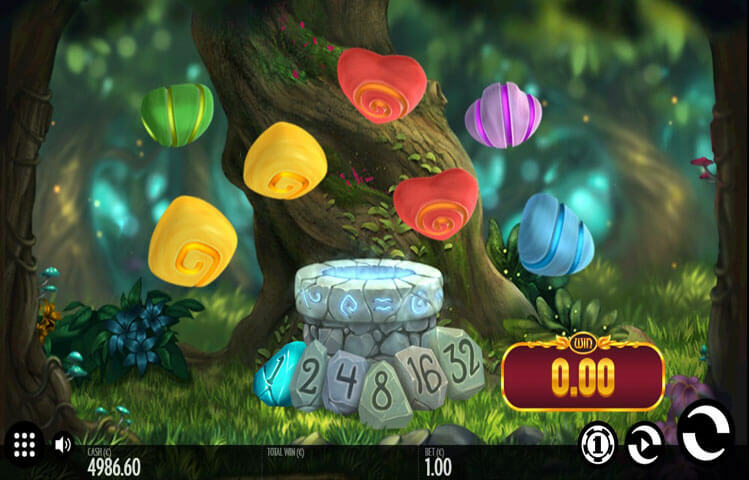 Since the game does not have clear reels, players will claim a payout when they manage to get 3 matching magical runes. That is not all, as whenever players claim a prize, the matching icons will vanish, then new ones will come out of the well to give players more winning chances. The visuals of the game depict the magical theme of the game. This is why players will see that the game takes place in a magical forest where players will find the well of wonders in the middle of the screen. As players initiate the game, players will see the magical colorful runes and symbols coming out of the well in wonderful animations. Well of Wonders is a highly rewarding slot machine, thanks to its game play features and bonuses. The first one is the wild icon, which can replace other icons, except the fairy symbol. Consecutive wins will result in multipliers and re spins. There is also the fairy feature that is triggered when the fairy icon appear on the reels. If players do not claim a prize, the fairy feature will be active in which all single icons will vanish and new ones will fill in their place.